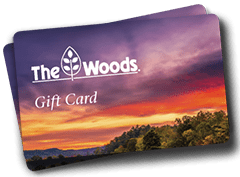 At The Woods, we offer a variety of accommodations to suit your needs, budget, and style. 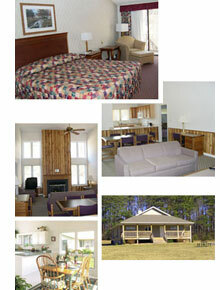 Choose from Meadow Cottage, Pinecrest Cottages, or Vacation Homes. Our six, four-bedroom Meadow Cottages (also known as Golf Cottages) are ideal for small groups. All Meadow Cottages have a charcoal grille, cable TV and telephones. Bedrooms are furnished with two twin beds and most have a private bath. The bedrooms open to a large Great Room with cathedral ceilings, kitchen and fireplace (operational from Oct. – Apr). Each Meadow Cottage sleeps 4 to 8 people. A two-night minimum stay is required on holiday weekends. These popular cottages offer central heating and air conditioning, gas fireplace (operational from Oct. – Apr), deck, one bedroom with queen bed, a queen-sized pull-out sofa in the living room, and deluxe bath with whirlpool tub. Kitchens are equipped for light housekeeping. All have cable television. Privately owned vacation homes and villas at The Woods are available for rental through our Front Desk. Some front the fairways of The Woods Golf Courses, while others offer a wooded setting. To view a list of all properties available please click the “Make Reservations” link above. Rates quoted do not include taxes or gratuities. Rates are effective as of January 1, 2015 and are subject to change without notice. Discounts: Frequent guest or AARP (discounts may not be combined). An advanced deposit equivalent to the first night’s lodging rate is required for all reservations. Deposit must be received within 7 days after making the reservation. A 48-hour cancellation notice is required on rentals of seven days or less. A 30-day cancellation notice is required on rentals of more than seven days. If multiple properties are booked there is a 30-day cancellation notice regardless of length of stay. Cancellations made after the required notice has passed will be assessed a fee equal to the deposit received. All rates include use of indoor sports center and outdoor swimming and tennis. If you would like our help in choosing your accomodations, please call 800-248-2222 and our staff will assist you. Be sure to mention the features that are most important to you, like a whirlpool bath, fireplace, or a fully-equipped kitchen. Complimentary WiFi in the Meadow Cottages & the Pinecrest Cottages.